Colin Carlson is no ordinary 13-year-old boy. At an age where most kids are just getting used to middle school or preparing to start high school, he’s already in college. He started reading when he was a toddler, and since then has advanced at a shockingly rapid rate of speed. 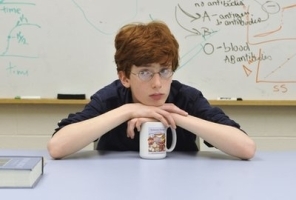 Right now, he’s enrolled at the University of Connecticut as a double major in ecology and evolutionary biology, as well as environmental studies. He’s also getting an education in the legal system, since he’s suing the college for age discrimination. One of Colin’s classes requires summer field work in South Africa, and he wants to follow his four-year plan. However, UConn officials have refused him, with a spokesman saying they generally only refuse students international work because of safety concerns. Even an offer by his mother, Jessica Offir, to pay her own way and go as his chaperone was met with refusal. It’s understandable in a way, since South Africa is incredibly dangerous. Now the young teen, who graduated high school at age 11, is taking UConn and the US Department of Education to court. Should he win, he’ll have plenty of money to go out exploring nature.